My husband plays beer-league hockey on Wednesday nights. I don't begrudge him this time that he takes; he needs it as much as I do since he does half the parenting in our home with three young daughters. If I'm lucky, his freedom occurs after 8 p.m. If I'm not, I must perform the Dance of Bedtime as a solo. Tonight, I am unlucky. An early game. Which means he will be gone for several hours during the most difficult time frame in our little home. "Good luck, Daddy!" our 6-year-old calls out to him as he slings his giant bag over his shoulder. He smiles back, thanks her and waves at me as he glides out the front door -- an unmistakable spring in his step. We are now alone, my daughters and I.
I am greatly outnumbered by happy little faces, goofy, laughing children who have no desire to go to bed. My oldest likes me to lie next to her. She doesn't require snuggling or songs -- she just simply needs my presence. She's grown to expect it. Ever since she was a tiny little baby, she's been my tough nut to crack where sleep is concerned. When she was little, I would rock and rock and rock her in our soft glider, comforted by the sounds of her noise maker in her pastel-covered room. I enjoyed the quiet of these nights. When it came time to transition her to a bed, I would lie down next to her and watch her fall asleep. I stayed with her that very first night in her "big girl" bed so she wouldn't get out over and over again. I haven't left it yet. My middle daughter is the snuggly one. She wants to wrap her arms around me and get as close as she possibly can. She wants to play with my hair between her fingers, listen to my breathing, feel my 'heartbeep' close to her body. Only then will she allow herself to drift off. Our 2-year-old is fiercely independent and loves her crib. It's a winning combination for me. She is perfectly happy with me leaving her for the night. I put her down, listen to her cheerfully yell and babble to herself through the monitor until she tires and willingly allows sleep to take over. Once I have her in bed, I start the dance with my other two daughters. After telling them repeatedly to brush their teeth and go to the bathroom (because asking them once doesn't seem to register with them), we read about witches and broomsticks and dragons who have lost their fiery breath. I answer question after question about the logistics of fire-breath and brooms taking flight. Finally, they yawn and rub their eyes as the story finishes. This evening is no different than any other evening. I put one child into bed and leave to tuck the other one in. The first child gets out of bed and heads to the bathroom for water. I tell the second child to stay in her room and go to sleep while I get the first child back to bed after drinking her water. By this time, the second child has gotten out of bed and is peeking her head out the door, looking for me. It's a dizzying dance filled with frustration. But I know that they only want one thing. And although I realize I've been working on bedtime for roughly an hour already, I give in. Because I know that they won't always be easily calmed by my presence. 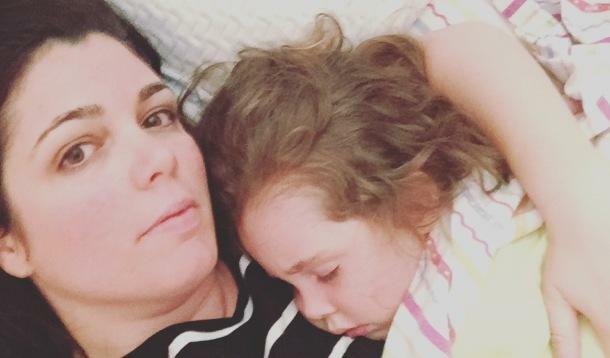 There will come a time that my middle daughters' slightly baby-like chubby arms will no longer be there, wrapped around my body as we lay face-to-face in bed. She will be 'too old' for playing with my hair while she tells me about her day and drifts off to sleep. There will be a time when my oldest won't reach out for my hand as her eyes flutter closed. My fingers wrapped around hers won't be her security any longer. So for now, I try to remember that this how the dance goes. And I try to let it wrap me up in its rhythm. I remind myself of this as I head back to my oldest daughter's room. She has called out for me again. I crawl into her bed and look at her face. She's tired. So I lay next to her, just as I did when she was a toddler. I watch her face as her eyes close. We lay like this for a while until a sound startles her and her eyes open suddenly. They dart around for a minute, confused by being woken. And then her eyes meet mine. A giant smile spreads across her face as she lets her eyes close again. I feel tears well up in my eyes. I smile back at her even though she is already drifting back off to sleep. I lay still for a while and l listen to her snore. The dance has left me exhausted, but happy.